Tropical storm Ana continues to outperform as a May tropical storm. Winds of 40-50 mph are starting to bear down on the Carolina coast near Cape Fear and in the coastal waters. Radar imagery this afternoon and evening continues to show winds at 2-4 kft in the 60-70 mph range, but it is doubtful that they will reach the surface. Light to moderate rain has been intermittent this Mother’s Day eve, but unfortunately the worst is to come. The Hurricane Hunters are flying tonight in what looks to be a very healthy storm. The impacts of dry air have lessened, and the cooler air aloft seems to be allowing Ana to hold steady, even allowing an eye-like feature to poke through on IR satellite this afternoon. 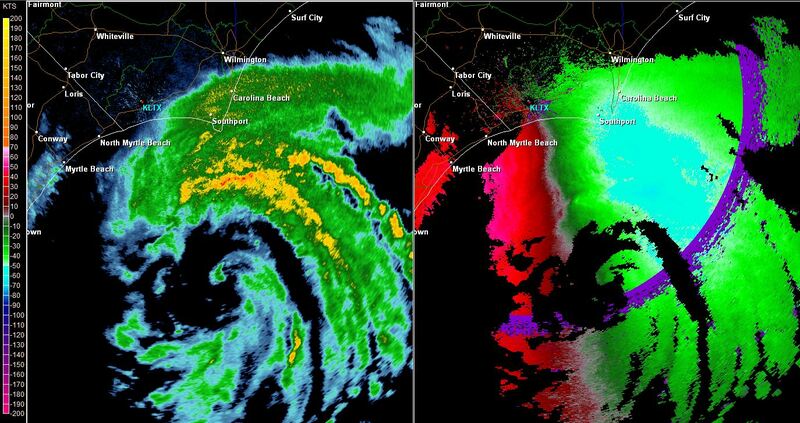 An eye-like feature or some local subsidence has appeared as an empty gyre region on Wilmington’s radar and as an intermittent warm spot throughout today on infrared imagery. Dry air seems to have taken a back seat to shear this afternoon. It was clear that Ana’s core was tilted toward the east or northeast with height this afternoon likely due to shear, but new convection seems to have uprighted the system. Microwave imagery continues to show that there is some mismatch between the low level and mid level centers. Shear clocked in at 20 kts on the 18Z SHIPS, and SST’s came in at around 74°F and cooling. Both of these are not necessarily favorable for development. It has to be reasoned that the upper level temperatures have to be cooler than average in order to get the needed temperature contrast between surface and troposphere to produce new convection. I also have to wonder if there are any non-tropical processes still going on at a minor scale. A slow transition back to those processes will occur in 48 hours. Evening water vapor over Tropical Storm Ana. 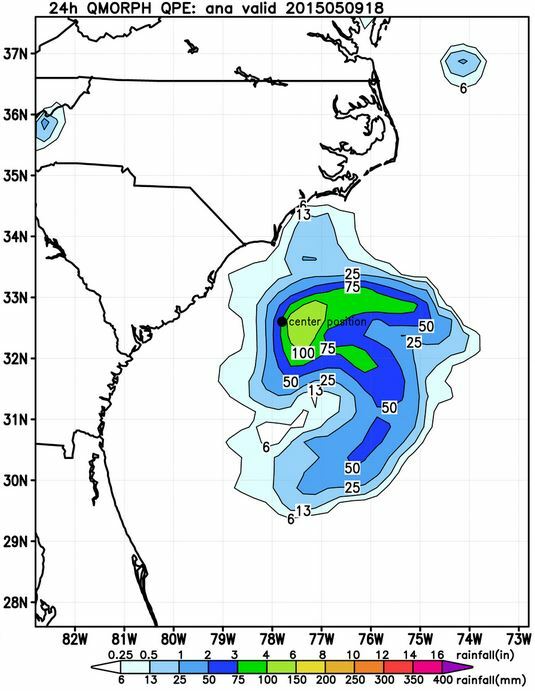 –Rainfall: 2-4″ of additional rainfall in possible between Myrtle Beach and Pamlico Sound, but much higher totals are possible over the Atlantic and coastal areas. This system is expected to be a slow mover, which means that isolated locations may see significantly higher totals. Satellite estimates show that upwards of 6” has fallen over water in the last 24 hours, and this rainfall rate could move ashore overnight. A flood watch is in effect for coastal areas. The highest rainfall totals will be near the NC/SC borderlands and points northward along the NC coast. Rain will not be persistent until late tonight. –Wind: Sustained winds of 40 mph or higher are occurring just off shore and are possible in the coastal waters and the Carolinas coast through Sunday evening, with winds gusting to 60 mph near the landfall point along the coast. Winds may be intermittent in nature tonight, becoming more sustained toward daybreak and into the afternoon. Tropical storm force sustained winds will begin in coastal NC/SC near the border soon, extending inland less than 25 miles from Charleston to Jacksonville, NC. Radar indicates winds up to 60 mph at 3,000ft, which could mix down in the form of gusts overnight. –Rip Currents/Surge: There is a high risk of rip currents this weekend mainly on the northern side of the low pressure system. 4-8 foot waves will accompany these currents with the highest 1/3rd of these waves up to 14 feet. Avoid the beach and the waters through this weekend. Water could rise as much as 2 feet along the Atlantic coastline of North Carolina through Sunday evening. Beach erosion is an issue due to the longevity of this system. –Mariners: A tropical storm warning continues through the weekend. Winds to tropical storm force, waves to 8 feet, and otherwise bad conditions are expected. A few gusts could reach 50 kt. Waves may reach 14 feet close to the center of circulation in the worst case scenario. –Tornadoes: SPC has placed coastal NC south of Cape Hatteras in a marginal risk for tornadoes in the front right quadrant as Ana approaches land tomorrow. The threat of tornadoes and damaging winds extends into northeastern inland SC and inland NC on overnight, and then up to Cape Hatteras and Pamlico Sound tomorrow through Tuesday morning. Any tornadoes will be weak and short-lived. *Experimental* product from the NHC that shows rainfall over the past 24 hours. The core of 4-6″ may make some headway toward the Carolina coast overnight. It can only be reasoned that Ana will have to weaken as it moves off of the Gulf Stream into the cooler shelf waters. Winds should come down to 40-50 mph before landfall near Myrtle Beach or the NC/SC border tomorrow morning or early afternoon – a track that is pretty well set now. This will NOT lessen the amount of rainfall any one spot will get, but it will lessen impacts from wind and possibly surge from current intensity. You’ll notice below that there is a secondary maximum at 60 hrs (Monday/Tuesday) over the Mid-Atlantic. The trough that is currently causing the moderate risk of severe weather over the plains states will be arriving at the Appalachians by then, and will scoop Ana up and out of the Carolinas by Sunday and the Mid-Atlantic by Tuesday. Winds often increase in these systems as they become non-tropical. 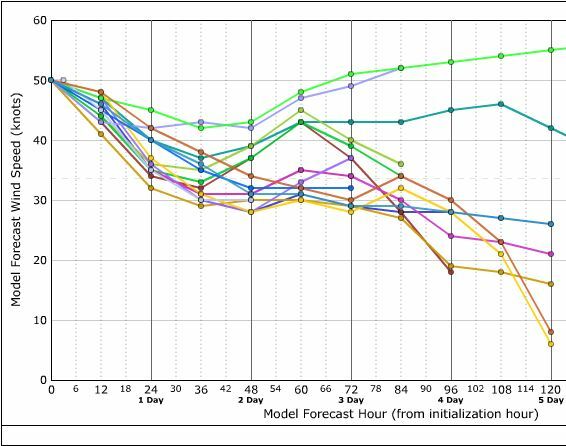 Model intensities through 5 days. Courtesy Tropical Atlantic. Bottom Line: It’ll be a pretty gross couple of days starting tonight in the Carolinas into early this week along the east coast. Rainfall looks to be the main issue now with some places possibly seeing 4-6″ around North Myrtle Beach and into coastal SE NC. I’ll leave you all with this night-time visible imagery from last night. 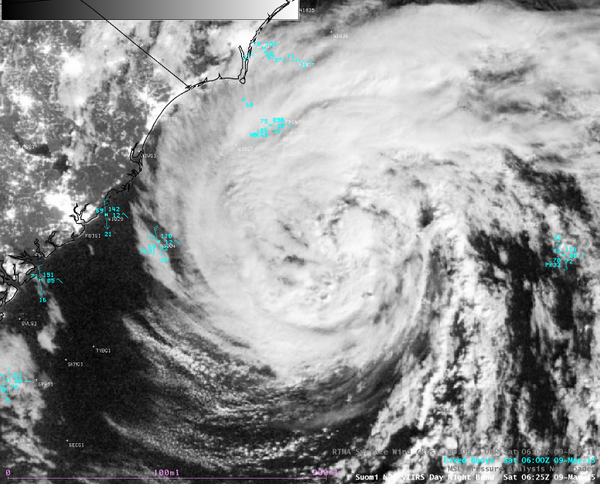 Day-Night Band VIIRS (visible) imagery from overnight on the 9th of May. If this weather isn’t your sort of thing, and maybe Ana has given you ideas about snowmen, you can head to the Rockies. If you like or fear severe weather instead, you can get that too in the central and southern Plains today and from Chicago to Brownsville over the next couple of days. Plenty to choose from, and plenty to learn from. That’s why I’m here. Have a good night, and wherever you are stay safe! You may also want to join Mark on Hurricane Track as he rides out this storm near Wrightsville Beach, NC @HurricaneTrack on twitter. Pictures and ustream from the coast. –Jonathan, @JonathanBelles, Updating throughout the evening! Posted on Saturday, May 9th, 2015, in Florida Weather. Bookmark the permalink. Leave a comment.